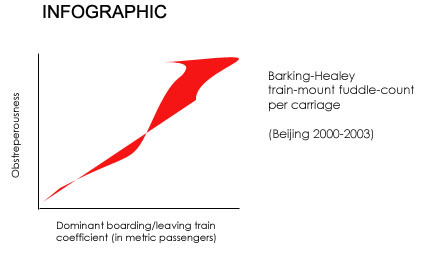 There were scenes of chaos on the Beijing underground since it was built as commuters were caught by surprise and off balance as trains slowed and accelerated at every station every day. "Trains have to slow down and accelerate in order to let people off and on at each respective stop," explained one Beijing underground technical spokesman. Critics point out that there is no warning of this phenomenon on any signs in the underground system, which leaves standing commuters and beggars completely unprepared each time the process occurs. Mr Wang, 43, from Beijing explained his experience in detail to anyone who would listen. "When I first boarded the train, everything was fine. The doors shut and I was confident that there would be no problems. I presumed that standing with my feet together and not holding on to anything was the best method for riding the train... but suddenly the train lurched violently and began to move. I stumbled several paces, luckily colliding with a foreigner who was actually holding on and who halted my fall. I felt very lucky and a little bit emotional." Above: Mr. Wang is still in a state of Minor Distress. Mr Wang went on to explain that he suffered another shock only a few minutes later when the train suddenly began to slow down. "I was still recovering from the initial incident when the train again underwent a sudden change in momentum." Fortunately Mr Wang was only travelling one stop, so was able to leave the train and continue his journey by bicycle. "I am pretty sure that these incidents were a one off, so I have no intention of doing anything differently in the future," added Mr Wang. Mr Wang's case is just one of a myriad of cases every day on the underground. Among the millions of others affected since the subway began public operation in 1977 were Mr and Mrs Song, "Old" Li, and former high-school sweethearts Zhang Deyin and Liu Gelong. This problem adds to the daily difficulties caused by confusion over the procedure of getting on and off trains. Problems frequently occur at every doorway on every train when people who believe "Xian shang hou xia" collide with others following the "Xian xia hou shang" set of guidelines. Both groups have huge followings, but numbers are hard to obtain as many people switch between the two philosophies during their journeys. Copyright © 2005 gou-rou.com. All Rights Reserved.